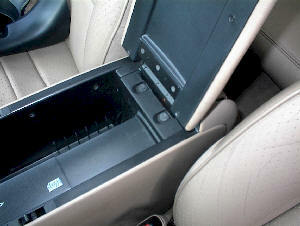 1) Lift cover from center console. 2) Remove coin holder insert. 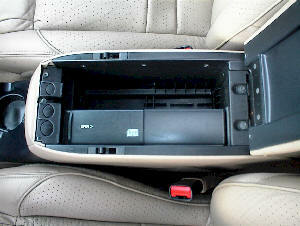 1) Remove front console trim panel by pulling away toward back of vehicle. 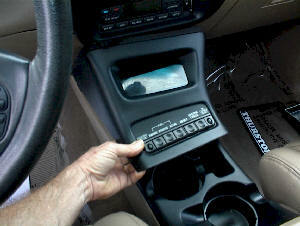 2) Set panel to passenger side. 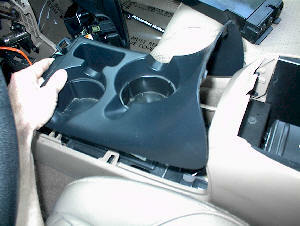 1) Remove cup holder trim by releasing straight up. 2) Set panel to side. 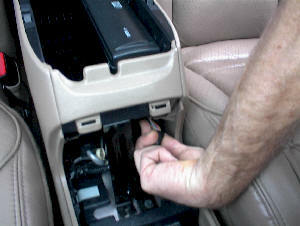 1) Inside cavity from panel removal release trigger for connector to CD changer. 1) Remove two 7mm bolts at leading edge of CD changer. 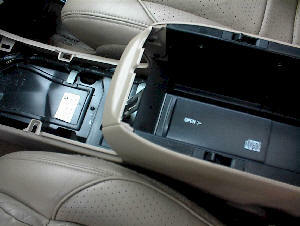 1) Remove two 7mm bolts at back edge of CD changer. 2) This is now a tight squeeze to remove. 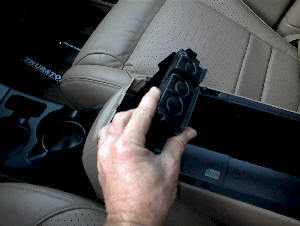 3) Pry back edge of plastic mounting assembly away from hinged cover while pulling up on CD changer. 4) Front edge of CD changer mounting assembly will also require pressure for removal.